Zero waste. Zero landfill. Lower carbon footprint. Green initiatives. For many companies these are just buzz words, but at Resource-One these words are our driving force and inspired our goal to help companies reduce their environmental risk and exposure by offering the best reuse/recycling programs. 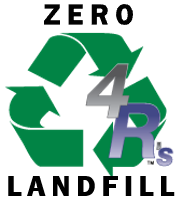 Our goal of helping companies gain greater environmental control lead us to develop our 4R philosophy: Rethink, Reduce, Reuse, Recycle. By meeting with you and touring your facility we can begin to help you stop seeing something as waste and begin to see it as a by-product. Through the use of visual aides (signs, banners, labels, etc.) we enhance internal communication and improve awareness of reuse/recycle programs – leading to greater adoption and increased program success. It is important to think outside of the box a little when it comes to waste reduction. After all, the easiest way to reduce waste is by not creating it at all. By minimizing the amount of product used, you are doing so much more than limiting physical waste. Making a product requires raw materials, energy and transportation – each of these have a significant impact on the earth, which can be minimized by reducing usage. Similar to reducing usage, reusing a product or item is a very effective way to save natural resources in a financially and environmentally-responsible way. Items can be reused in the samefunction as before, or you can maximize the life of products through one of the many alternative use programs that exist today – you would be shocked with how many different products can be repurposed for another use. Recycling grants a new lease of life to materials that would otherwise be thrown away as trash. Besides being a very useful process, recycling can have a hugely positive impact on your community, and the environment in general. By choosing to recycle, you can reduce the amount of waste sent to landfills and incinerators, prevent pollution, conserve natural resources, and sustain the environment for future generations.